Tony Frary moved to the Medford Lakes area 45 years ago and never needed to move again. All three of her children were raised here and return every year for Christmas and the Canoe Carnival. “I am still passionate about living in the Lakes,” Frary said. Frary pays tribute to the uniqueness of the town in her new book. She acknowledges all of its features as she dives into her appreciation for the trees, fields, camps and lakes that make it so special to her. Along with being a writer, she is also an art enthusiast who has taught art to two generations of students of the Medford Lakes School District, where she was named as the first recipient of the school district’s Teacher of the Year award. Before her successful career as an art teacher, she attended Connecticut College, a small liberal arts school in New London where she majored in art and minored in biology. 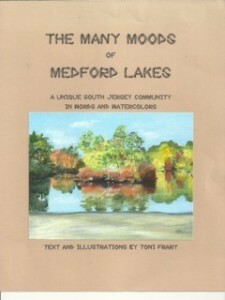 “Over the years, I have painted many of the scenes that make living here so special, so I decided to incorporate them in the book celebrating what Medford Lakes is all about,” Frary said. The book is 34 pages and is primarily all of her artwork with some descriptive text to accompany it. Frary’s paintings focus on animals, scenery and anything to do with the natural world. Recently, her work was displayed in the art gallery at Medford Leas, though many of her original paintings and prints can be found in area homes as well. Over the years, Frary has found herself molding her art around that of Robert Bateman, a Canadian wildlife artist who has had his paintings displayed at the Smithsonian in Washington, D.C., and has a similar passion for nature. At an age when many people have adopted a sedentary lifestyle, she now keeps busy with commission work and has continued to teach at a retirement center, art center, camp programs and her church, the Cathedral of the Woods. Frary will be available to sign her new book at Hawthorne Gallery on Stokes Road on Saturday, Nov. 7 and Saturday Nov 14 from 11 a.m. to 2 p.m.
“My hope is that you will enjoy viewing the paintings and commentary as much as I have enjoyed painting them,” Frary said. So far, that hope has become a reality as she has sold 160 copies in the book’s first couple weeks. To reserve your copy, contact Frary at (609) 654–5211 or e-mail Textoni7@verizon.net. The book is also available for purchase at the nearby Lakes Office Supply store. Part of the proceeds will go to the Protestant Community Church and to the Medford Lakes Garden Club.